First 3D printing was for single parts, then it became for short batches of 10, 100, 500 and thousands of parts. With the arrival of HP and planar technologies, we’ve started to refer to as short batches production runs of several thousand and even a million pieces. Now GE Additive is using its pioneering Avio Aero plant in Cameri to go into some serious part production capabilities using mainly EBM technology and the new Spectra H systems. David Joyce, Vice Chairman of GE and President and CEO of GE Aviation recently stated that “Additive manufacturing is the Netflix of manufacturing”. And it might have been the Avio Aero plant in Cameri, that inspired his choice of words. That is because, Cameri has been making a name for itself recently, following an expansion plan that has increased its production capacity like never before. The plan has been accompanied – in lockstep – by Arcam EBM, a division of GE Additive whose electron beam machines having been manufacturing airplane engine parts at the Novara plant since it was established in 2013. A few weeks ago the production area was increased by 600 sqm, and the plant currently hosts some 35 Arcam machines. Of these, there are 31 Arcam A2X machines. The other 4 machines are the new Arcam EBM Spectra H. There will be at least another 16 Spectra H machines and in the short run before the Cameri plant is expected to undergo another major expansion run. Eventually, the entire machine fleet will be replaced by the new models. The A2X machines heat and melt layer by layer metal powder together, producing TiAl (titanium aluminum) blades for assembly on the low-pressure turbine of the new large GE9X engine, which flew for the first time one year ago. Everything starts with the technical drawing of the blades, and once it is sent to the A2X machine, it produces 6 blades per batch in about three days. Arcam’s new Spectra H machine can produce up to 10, in around the same time. Additively manufactured TiAl blades are half the weight of traditional nickel alloy turbine blades. For the GE9X engine, this means a fuel consumption reduction of 10% (and therefore emissions), compared to its predecessor, the GE90. The GE9X, which boasts about 200 kg less weight, is expected to enter service in 2020. And, it is estimated that about 60 thousand blades will be produced between 2022 and 2023. The new parts will have greater mechanical and electronic stability, integrating new geometries. 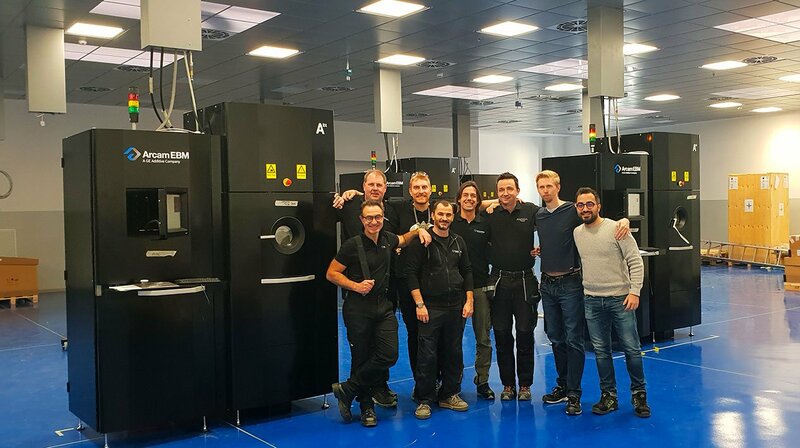 Arcam has followed the evolution and growth of the technology and capacity of the Novara plant since the very beginning. In 2011 there were only six machines in Cameri. Today there are more than 30 machines there and that the number of Spectra H machines will increase. There is no doubt that we are truly witnessing a momentous paradigm shift. Indeed, from the beginning of April this year, and for the very first time since its opening, continuous production cycles will begin in Cameri.